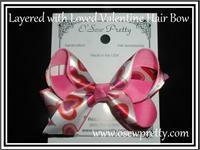 Why not show her how special she is with a Valentine's Day Hair Bow! 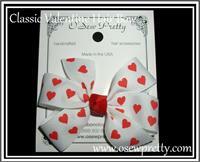 Here is a great idea, clip the hair bow to her Valentine card. 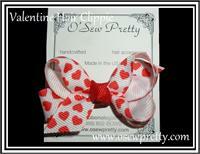 Perfect to wear to her school's Valentine party. Made especially for the little Ioving Princess in your life. Love is in the air or should we say, on top of her head! 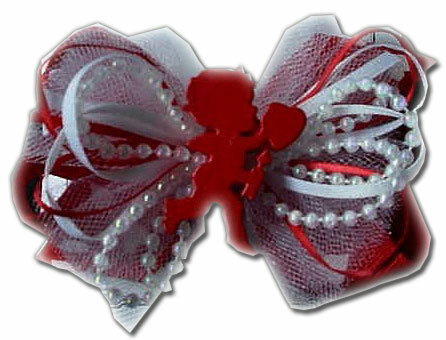 Our Cupid bow is extremely detailed with hearts, pearls and more. 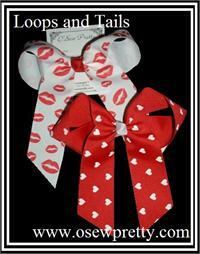 Show the little girl in your life just how much she is loved when you give her this Valentine's Day Hair Bow. 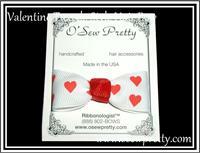 This is the sweetest little heart bow. 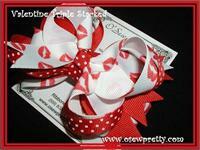 The same Classic Collection design with 12 fun Valentine ribbon choices. This tiny little cherub can't wait to spread his love while snuggled in Gold enhanced tulle. This little cherub can't wait to spread his love while snuggled in Gold enhanced tulle. 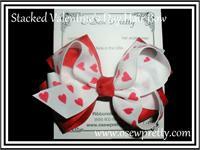 This is the perfect bow for the little sweetheart in your life. This will surely bring a smile to your Valentine. 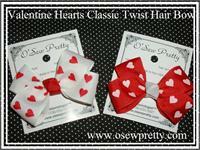 The "Classic" with a bit of a twist creates this Valentine hair bow. 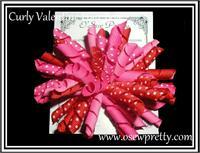 Valentine candy hearts layered on your choice of accent color. Makes a great Valentine's Day Gift! 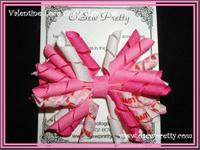 Shown in Sweet candy hearts for your "SWEET HEART". 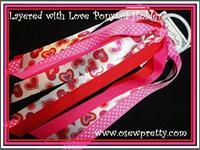 Choose From 15 different Valentine's Day printed ribbon. 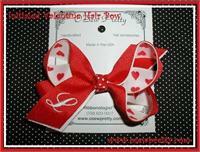 This Valentine's Day hair bow is full of red hearts and LOVE! 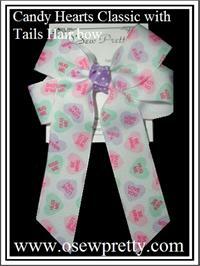 Our original Loops with tails hair bow is not just for cheerleaders any more! 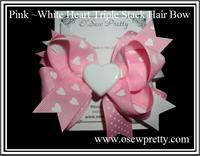 If the young lady in your life is just to big for hair bows but still ties ribbon in her hair then she will love this one. Made especially for the little sweetheart in your life. 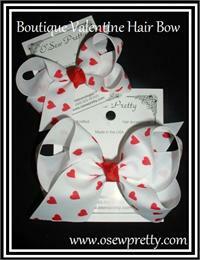 You can say "SWEET TREATS" with this unique style hair bow. Adorable as piggy tails. 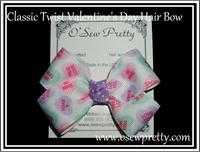 Valentine candy hearts printed ribbon made in to our boutique style hair bow. Available in three sizes. Makes a great Valentine Gift! 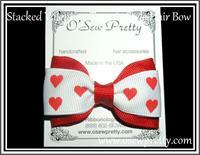 A simple but stylish hair bow in your choice of Valentine's Day Ribbon. 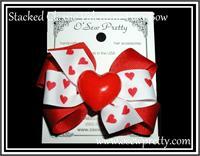 A classic red heart print, layered on a matching solid ribbon. Shown in small. 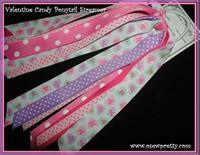 This Valentine pony tail streamer is full of orchid, Hot Pinks, and a custom candy heart ribbon. 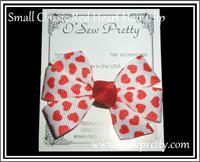 This is the perfect sized hair bow for the little sweetheart in your life.